While the HP Think Beyond event of February 9th is just days away, here’s an announcement of sorts that webOS users won’t have to wait for. According to HP Palm’s official product support page, webOS 2.x is syncing device calendars, in some use case scenarios for a little as only three months. Not the kind of announcement you were looking for? Likely not, but this is what PreCentral forum members have encountered from Palm as an official response to what appears to be some rather odd calendar syncing characteristics in webOS 2.x. 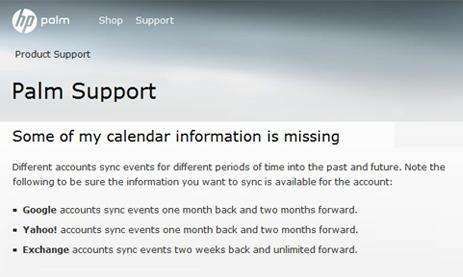 Filed under the support banner of “Some of my calendar information is missing” on the HP Palm support website is the following note: “Different accounts sync events for different periods of time into the past and future.” The support article then goes on to explain that Google, Yahoo! and Exchange calendars do in fact sync events for as little as three months in varying combinations depending on which of the three calendars you are syncing with on your webOS 2.x device. As far as we can tell the support article is treating these odd syncing characteristics as standard behavior. We are certainly in the early stages of webOS 2.0 and any iterative improvements that are sure to follow, however, calendar syncing issues of this sort as standard fare are not among the new features we have been anticipating in the evolution of webOS. Let’s hope that further light shed on the subject renders an announcement of a different sort (as in a fix) in the near future as webOS 2.x is rolled out en masse.